For 15 years Loïc has been serving a high class Pagan Black dish under the banner of BELENOS. On the occasion of his fifth album "Yen Sonn Gardis" the French talks about his musical producing as well as his homeland which is a huge source of inspiration for him. Like with its predecessor "Chemins De Souffrance" one can't help to think 'How can this be done by one person alone' when listening to "Yen Sonn Gardis" but exclusive of the time from 1998 to 2004 BELENOS has always been a one man project. And Loïc is visibly satisfied with his new creation. "I'm satisfied with it especially for the performance of the drums, and all these new titles seem to me rather good. Maybe the guitar sound could've been better, though. The experiments I wished to make were very satisfactory: the Breton language and a little violin. To make this album I needed three months of preparation in particular for the drums. The following six months I recorded the whole album, wrote the lyrics and realised everything from the layout up to the mastering." Regarding the previous album Loïc comments the differences that "Yen Sonn Gardis" is a good mixture of everything BELENOS can offer after 15 years in 2010. "The sound of the drums is more natural I think. I'm rather proud of this. "Chemins De Souffrance" is the coldest and darkest BELENOS album, and I don't think I can do it any better in this way. "Yen Sonn Gardis" delivers a different atmosphere and sound with several titles much more 'pagan' but we also find titles very inspired by 'old school nordic black metal' here or other tracks even more quiet and depressive..." Already on "Chemins De Souffrance" Loïc uses some words in the Breton language. With "Yen Sonn Gardis" he takes the final step to release an album entirely in Breton. "Since 2002 I regularly used Breton words in certain titles, and since this date I said to myself that I was going to write a full album in this language one day. Today that's done! Breton is an old celtic language that only 200000 persons all over the world are able to speak, that's less than Icelandic! And it sounds extremely good for black metal. I really don't regret this choice." Thematically BELENOS centres mostly on his homeland although not following a particular concept as he does on earlier works like "Chants De Bataille" or "Chemins De Souffrance". "I talk about Bretagne, of course: the inviolate moor with the sentinels of stone, the storm which makes cliffs moan, the druidic rites (still practised here), the celtic pride, some legendary battles, the celtic woodmaster... then I talk about cold landscapes like in Iceland where I'm going regularly. The lyrics I write don't always talk about Bretagne but I spoke a lot about the Breton legend on the ankou and the youdig which is one door of hell (in ´L'antre noir on the "Spicilège" album or ´War hent an Ankou´ on "Chemins De Souffrance"). All these beliefs are still strong here and the wild places which are attributed to them are perfectly well chosen." Another tale is that of Abélard and Héloïse which can be seen as the Breton version of Romeo and Juliet or Tristan and Isole, love stories without happy end. Questioning Loïc if such stories also inspire him or if he could imagine them as a base for a song he states that "this story is well known, indeed, but without doubt not 'evil and dark' enough to be used in BELENOS, at least for today." So what about François René de Chateaubriand. Philistines may only connect this name with a cut from the tenderloin and not know that this politician, diplomat and author is also considered as the father of French romanticism. But Loïc dismisses this as a source of inspiration. "No, I don't think BELENOS is inspired by romanticism. This period, surely interesting, is too recent. I feel mainly inspired by old traditions from the antiquity, Breton legends or themes like winter or loneliness." Musically one name comes to mind instantly when talking about Brittany - Alan Stivell. Loïc admits that he likes the music but it doesn't reflect in the music of BELENOS. "He is probably the most respectable musician here, defending the values and the local culture for decades. I like this kind of music but I don't think I have been influenced by it. You know, Celtic music is rather festive and rarely dark, But there is a certain way to combine notes which can sound celtic, and I have found my own dark melodies like that, not directly from the traditional celtic music. 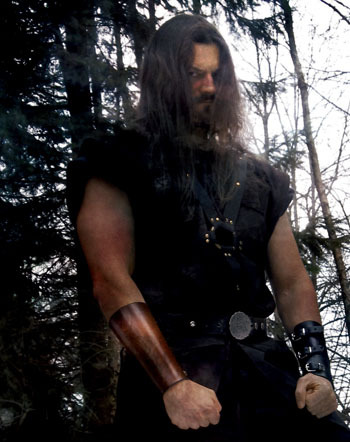 There are very few ardent defenders of the Breton Celtic culture in the metal scene. I hope to be a deserving representative." Once again the entire creational process of an album is executed by Loïc alone, from the composing of the music to the recording, mix and mastering. A procedure which only holds advantages for him. "And you can add the creation of the layout, too. I'd say for me there are only advantages: no waste of time in neverending rehearsals, I record things when I want and above all when I'm isnpired to it. That's why my recordings spread out over several months, that's no problem for me and gets me the backing which I need. The most difficult moment for me is always the mix. Otherwise it's just happiness!" In doing so the music is more important than the lyrics because "would be the interest of some extremely well written lyrics on a poor music? Almost nothing." But there is one aspect on "Yen Sonn Gardis" where he gladly accepts some help. In songs like ´Hollved Hirisus´ or ´Mestr Ar C'Hoad´ strings can be heard which are definitely not created synthetically. "On ´Hollved Hirisus´ it's a violin solo performed by a friend but also on ´Gorsedd´ on wich we can find typical celtic violin tunes. The introduction of ´Mestr Ar C'Hoad´ is a medieval instrument called hurdy gurdy." With every album BELENOS releases Loïc cements his reputation as a perfectionist which can be heard in the diversified song structures as well as the vocal entries and instrumentation. The further this is pushed the more difficult it gets to imagine how this would sound live. Early 2010 BELENOS is a ´real´ band for some time so as to perform at some festivals but then there's radio silence on the live front again and no further plans are made. Would Loïc even consider a BELENOS tour? "It's obvious that most of the BELENOS songs are extremely hard to play on stage. We have chosen to play four times this year after more than five years of live inactivity. The result was good but not exceptional, and it's due to the fact that it's extremely hard to find competent and available musicians in Bretagne, in France in general. Honestly I don't think a tour could happen, and if someone proposed us such thing there would be only few chances for us to be available and ready for it." These musicians only accompany BELENOS as live members. In generell Loïc creates the outward impression of ´never again´ when asked about the possibility if he could imagine BELENOS not being a one man project again. "It was a hell to mange from 1998 until 2004, wasting my time rehearsing again and again for the other musicians whose level was not always good enough which resulted in many changes in the line-up. That was my worst mistake with the band, I should've have considered all these people as session members only, just for stage during certain periods. Today it works like this. I have just session members for live and nothing else. I like to work alone, I feel perfectly well in everything I do and don't want to be helped by a third person except when I ask for it (on YSG for the violin parts)." Let's have a quick look at the future. For 2011 Loïc plans the rereleases of the sold out BELENOS albums "Chants De Bataille" and - of course - "Spicilége". "Then a sixth album will be released in 2012. Today I have already five new songs for it but it will demand hundreds hours of work before we have the CD in our hands." There is one question left we'd like to have an answer for regarding Brittany before we end this conversation. Keyword ´little Gallic village´... "I really like Asterix and Obelix, and I would add that their small village is located very close to my home. It's now called Yaudet where archaeological excavations took place, revealing a Gallic village. And as for Obelix, I like megalithes a lot. I haven two dolmens in my garden." But he wouldn't carry them around, right? For further information check out the BELENOS website or his myspace. Interview done by Endrew. August 2010.